Odds are you have managed care -- but do you understand it? If you live in the U.S. and have health insurance, there's at least a 75% chance that you're part of a managed care program. Despite this tremendous reach, however, many Americans don't have a solid understanding of what managed care is. Here's what you need to know about this pervasive part of the U.S. healthcare system. At its core, managed care is about money. Increasing healthcare costs aren't a new concern -- over four decades ago, people worried about medical inflation. Discussions about how to control the growth of healthcare costs during the Nixon Administration ultimately led to passage of the Health Maintenance Organization Act of 1973, which ushered managed care into the U.S. in a major way. Instead of the "if it ain't broke, don't fix it" mentality, managed care focuses on preventive care as a strategy to lower healthcare costs. Physician checkups and age-based screening for various diseases are important to identify potential health problems early -- before the costs of treatment become greater. There are three primary types of managed care organizations: Health Maintenance Organizations (HMOs), Preferred Provider Organizations (PPOs), and Point of Service (POS) plans. PPOs are by far the most common form of managed care in the U.S. Opinions vary greatly about just how effective managed care actually is. Opponents point to high overhead costs at large HMOs and lower quality scores as signs that managed care doesn't work well. But, as the old saying goes, "perception is reality". And the perception of insurers and employers seems to be that managed care controls costs better than healthcare that isn't managed. Another big indicator that managed care has enjoyed success is the performance of the stocks of health insurers that have heavily focused on managed care. 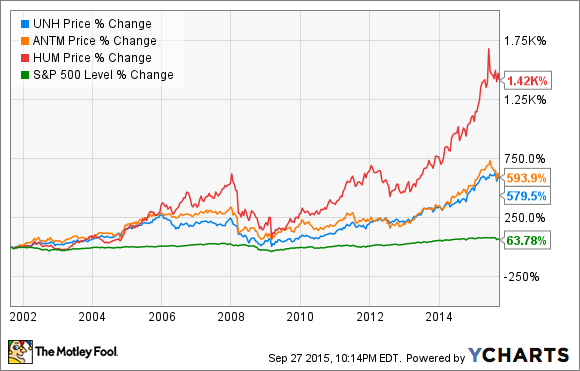 Take a look at how three of the largest U.S. health insurers -- UnitedHealth Group (NYSE:UNH), Anthem (NYSE:ANTM), and Humana (NYSE:HUM) -- have fared over the last 14 years compared to the S&P 500 index. Then there's the growth of managed care in government healthcare programs. The number of Medicaid members enrolled in managed care programs has more than doubled since 2008. During that same period, the number of members enrolled in Medicare Advantage managed care plans jumped more than 70%. Expect managed care to become an even bigger factor in Medicare and Medicaid. As more Americans age, federal and state governments will become even more desperate to find ways to control healthcare costs. The three large health insurers mentioned previously all stand to benefit from this trend. UnitedHealth generates more revenue from its Medicare & Retirement business segment than any other outside of its Optum business unit. Medicaid represents the company's fastest-growing business in terms of individuals covered. Anthem makes more than half of its revenue from its Government Business unit, which includes Medicare and Medicaid plans. Like UnitedHealth, Anthem's biggest membership growth comes from Medicaid -- with nearly 20% year-over-year growth reported last quarter. Outside of these government programs, managed care's role in healthcare could change. Increasing numbers of employers are shifting workers to high-deductible health plans, moving more costs to employees. The portion paid by insurers, though, will likely continue to include elements of managed care.